Water Heaters - Approved Plumbing Co.
At Approved Plumbing we provide a full range of water heating products and services for both residential and commercial use. The most common options include gas, electric, solar, tankless and point of use. Our goal is to provide you with fast, efficient and friendly service and provide you with the best options for all of your heating needs. Many new water heaters qualify for up to a $300 tax credit. 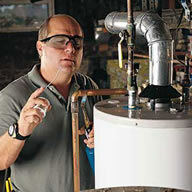 Gas – If you have gas available, a gas hot water heater is often your best long term choice. Gas is usually cheaper and much faster at heating a tankful of water than electricity. Approved Plumbing offers a complete line of gas heating options. Electric – If gas is not an option, do not despair, the new technology used in electric hot water heaters is both faster and more cost effective that older models. Solar -Solar water heaters consist of a set of panels and a storage tank. They use energy from the sun to heat your water. In less sunny climates, they can be used in conjunction with either a gas or electric system. Need more info – give Approved Plumbing a call. Tankless – Never take another cold shower again! Rinnai, Rheem and Navien tankless water heaters heat water on demand, so you’re never limited to a fixed pre-heated supply as with a tank. You’ll enjoy hot water when you want it, for as long as you need it. Point of use – These small units install easily under a sink or cabinet. They are most effective in areas where there is no easy access to a hot water source including offices, shopping malls, service stations and other commercial applications where economical hot water is needed. Approved Plumbing offers water heater warranties for up to 12 yrs!